From the hop heads at Longmont-based Oskar Blues Brewery comes a new hop-forward rotating Can-O-Bliss IPA series — a celebration of experimental and innovative hop varieties. 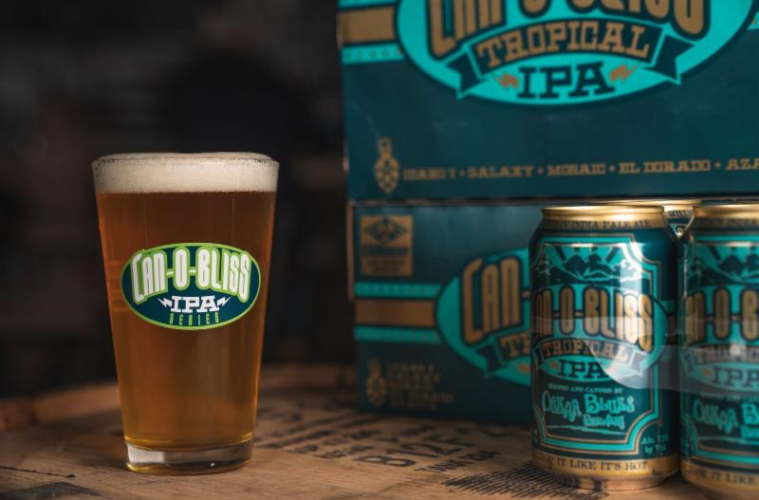 The new series is set to kick-off on January 26 with release parties in Oskar Blues taprooms nationwide of the Tropical IPA, the first release in the three-part series. The new offering highlights fruit-forward flavors from a combination of Mosaic, Azacca, Galaxy, El Dorado and Idaho 7 hops. The Tropical IPA is the first beer by Oskar Blues to spend time in the brewery’s new centrifuge — a high tech piece of equipment that applies rapidly rotating centrifugal force to separate liquids from solids. In this case, the centrifuge separates out, yeast and hop remnants to create a cleaner, clearer final product that still retains the pungent, aromatic oils from the hops. The beer will officially be released on Saturday, January 26 and available on draft and in 12-ounce cans in six-packs and twelve-packs at Oskar Blues accounts across the country. On tap next in the series is a Hazy IPA packed with stone fruit, melon and peach flavors, followed by a zesty Citrusy IPA to be released later in the year. The brewery’s Tasty Weasel taproom in Longmont and Boulder taproom located on the Pearl Street Mall are set to throw down Tropical IPA release parties from 5-8 p.m. on Friday, January 26. Both locations will feature a hop sensory experience, hoppy flights of limited release Oskar Blues IPAs and live music.